Look for a Dim Sum restaurant. and they stamp your car. At the end they tally up the stamps. So you can imagine my delight when we're walking through China Town in London and just after doing the tango with a giant panda bear, we discover a little market with a young Chinese woman and a fresh batch of Chinese dumplings. Shannon still talks about the Panda bear. 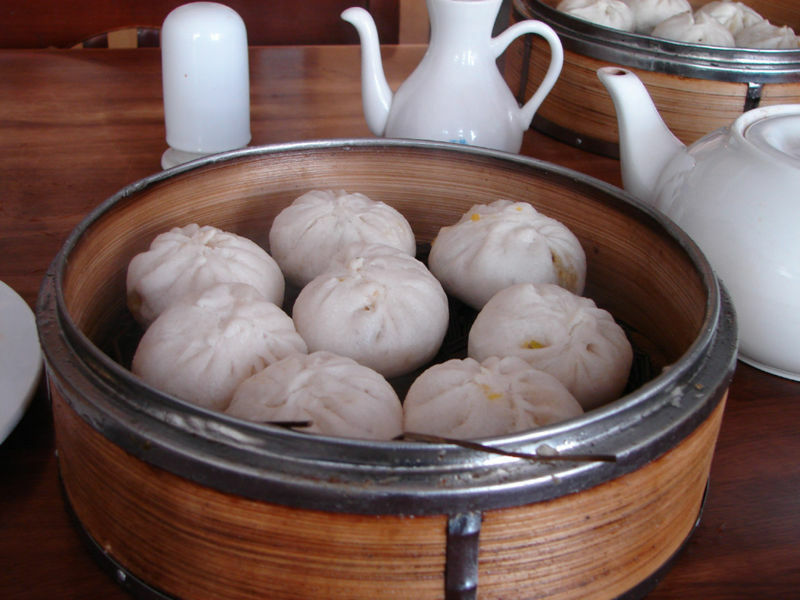 Stuffed with pork, beef, or chicken, a baozi can be very small almost bite-size (Xiaolongbao) or If you find them like we did they're about 6-8 inches round, hand-pressed closed breading (Mantou) with a Asian stew filling consisting of meats and/or vegetables. They are, for a better lack of the words... simply the most amazing Chinese food I've ever eaten. It should be, it's their comfort food. It's a recipe, I've vowed to tackle in the next few months. There's something to be said with waking up in the morning, hitting an authentic French Bakery for breakfast in London, and then walking the streets for lunch eating a baozi dumpling. We so often forget how much taste is a sense, and providing our brain the necessary sensory input during certain experiences can make the journey so much more fun! The vendor realized we "weren't from around here" with our American dialects, and asked "where are you from?" Shannon replied "North Carolina". We might as well been speaking to Greek, because from the look on her face she didn't recognize that country.